The Federal Executive Council (FEC) rose from its weekly meeting in the State House Abuja Wednesday with cheery news of the forthcoming repatriation of $500 million loot from United Kingdom, United States and France to Nigeria. 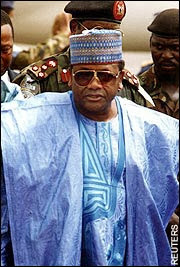 The money was part of the huge sums stolen by the former despotic leader, Gen. Sani Abacha. Making the disclosure while briefing journalists at the end of the meeting, the Attorney General of the Federation (AGF) and Minister of Justice, Malam Abubakar Malami, said the move was the fallout of negotiations between the federal government and the three countries. According to him, the expected sum is coming barely a few months after the repatriation of $322 million Abacha loot to Nigeria from Switzerland following an agreement signed by Nigeria and Switzerland. Malami, who said the processes leading to the repatriation and the aftermath were reported to the council Wednesday, also disclosed that the council approved the payment of N500 million as legal fee to lawyers engaged in the litigation between the federal government and MTN over the N1 trillion fine imposed on the latter by the Nigeria Communications Commission (NCC). "The council approved the payment of professional fees to lawyers engaged by the federal government relating to the MTN case instituted against the federal government in pursuance of penalty of over N1 trillion imposed by the government on MTN. "MTN, as you will recall, instituted a case seeking to retrain the federal government from recovering the over N1 trillion imposed on it. The federal government engaged the services of lawyers to put up defence on its behalf. As a result, the case was eventually settled by the parties amicably and arising from that settlement the lawyers were entitled to their fees. "The federal government has now sanctioned the payment of N500 million for the N330 billion agreed upon for the alleged certain breaches in their operations. This amount is less than one per cent of the fee instead of the internationally recognised fee which is pegged at five per cent. "Finally was a report on the global forum on assets recovery. You will recall that in December 2017, the federal government participated in global forum on asset recovery in Washington DC and during that forum, Nigeria and Switzerland signed agreement that paved the way for the repatriation of $322 million relating to looted assets and on the account of that the amount was eventually repatriated back to Nigeria. "What transpired was only reported back to the council today. The report today was not only about the signing of the agreement but the report of the eventual repatriation of the amount of money that was signed and agreed to be repatriated during the forum. "Nigeria has also engaged other countries including the UK, US, France and others in further negotiations relating to repatriation and I am happy to report that we are almost concluding the processes relating to the repatriation of additional $500 million," Malami said. Malami also responded to questions on the legality and legitimacy of the declaration of June 12 as a public holiday, as well as the conferment of posthumous awards on the late Chief MKO Abiola and Chief Gani Fawehinmi as well as Ambassador Baba Gana Kingibe. The president had on June 6, proclaimed June 12 as the new Democracy Day, replacing the hitherto May 29 Democracy in acknowledgement of June 12, 1993 presidential election described as the freest and fairest in Nigeria's history and won by the late business magnate, Chief MKO Abiola, but unjustly annulled by former military president, General Ibrahim Babangida. Consequently, the president conferred the highest honour of the Grand Commander of the Federal Republic (GCFR) on Abiola on Tuesday. He also conferred the award of the Grand Commander of the Order of Nigeria (GCON) on Abiola's running mate, Kingibe, and Chief Gani Fawehinmi posthumously in recognition of his gallant fight for the actualisation of June 12 mandate. But the moves had been criticised by some Nigerians who argued that the president lacked the power to proclaim June 12 as public holiday without amending Public Holidays Act to pave the way for the replacement of May 29 with June 12 as the new Democracy Day. The president was also criticised for unilaterally conferring the national honours on the recipients without consulting the National Council of State. But Malami in his defence, said the president was only duty bound to consult the Governing Board in relation to the conferment of the National Merit Award, insisting that there is no law compelling the president to make any consultation before conferring national honours on anyone. Malami also stated that it was not the first time that a posthumous national honours award was conferred on anyone, pointing out that former Head of State, Gen. Murtala Muhammed, had once been posthumously honoured. However, he admitted that Public Holidays Act needed to be amended before June 12 Democracy Day can come into effect as a public holiday. Consequently, he said the process of amending the Act had already been put in place and the declaration would not be effective until the amendment is concluded. "National Merit Award Act and the Nigerian National Honours Act are two distinct and different applicable laws as far as National honours awards are concerned. You have the National Merit Award on the strength of which we have the law of the governing board come into effect and then as it relates to the National Honours Act, the board does not have any relevance in terms of processing of the honours. "Above all, we equally have in existence, a precedent as it relates to the award of posthumous honours. I can recall that a former Head of State, General Muhammed was equally honoured posthumously, among others. "As it relates to public holidays, there is truly a Public Holidays Act, but it is about the process of amendment. At any rate, the Act can be amended and the process of amendment has been put in place. "So, when the Act has been fully amended, the declaration of the President will come into effect. It is a declaration of intention, a declaration of desire and that will eventually be given effect with the act of amendment of the existing law," he said.